This post originally appeared on Babble and is reprinted with permission. Most Extra Parents is a new video series from Babble profiling parents from around the world who go the "extra" mile for their kids in every sense of the word. This week, we're spotlighting the Pfaff family from Los Angeles, California, who take millennial parenting to the next level. Let's be honest: We're all guilty of occasionally hoarding random things we aren't exactly sure we'll ever use but can't seem to part with (just in case). Yet while most of us will eventually wind up tossing our miscellaneous junk in the garbage, others find creative uses for them that may leave the rest of us wondering, "Why didn't I think of that?" Such is the case for Los Angeles, California, residents Ian and Emily Pfaff. 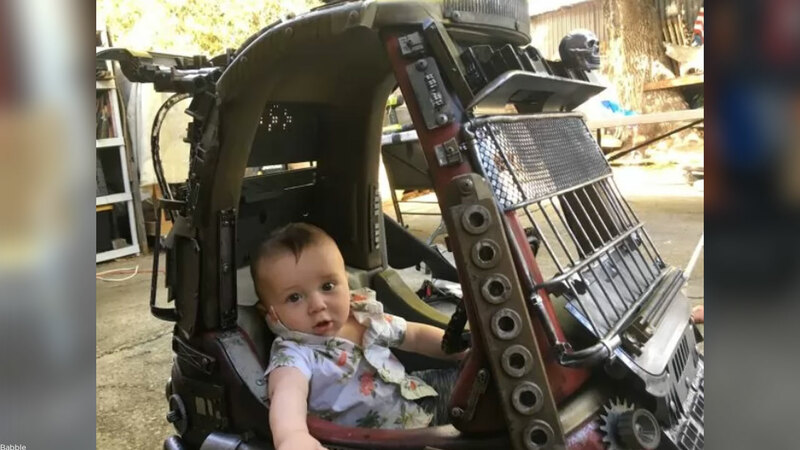 The parents of two have taken to repurposing discarded household items and gluing them on to - of all things - toy cars. We're talking breast pumps, door hinges, old creepy dolls...you name it. Once they finished, they couldn't wait to get started on another for their son Ben, which is pretty awesome in its own right. 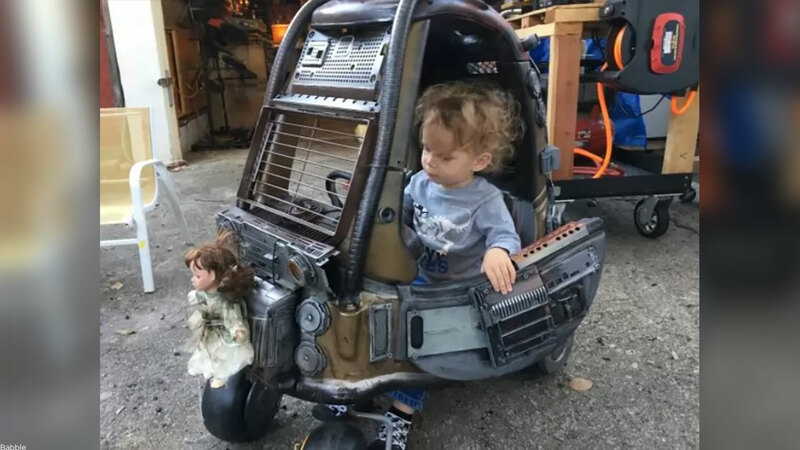 "Some neighbor let us know that there's an identical (toy) car in the neighborhood, so I went and got the new car and made Ben's Post-Apocalypse Mobile," Ian tells Babble. "He's got some rad exhaust pipes on the side," says Ian, while pointing out other items he used on the car. "That's a leaf blower ... this spoiler's a printer." Seriously - how awesome are these cars?! Junior and Ben have gotta be some of the coolest kids on the block riding around in these tricked-out kid cars. This isn't the first creative project the Pfaffs have undertaken, though. They're constantly creating things in their at-home workshop, which makes for a pretty entertaining home life. "A lot of these projects just kind of come up organically," says Ian. "Like something fun happens we both kind of dive in 100% and then we just make a thing." The parents' unique hobby has also recently grown into a family activity. "We do spend a lot of time together crafting as family time, and now the kids are starting to help out, too," Emily explains. I don't know about you, but I can't wait to see what the Pfaffs come up with next!